As the fate of 13 Cataract Street is brewing, perhaps a step back to look at all of the possibilities is worth a moment. 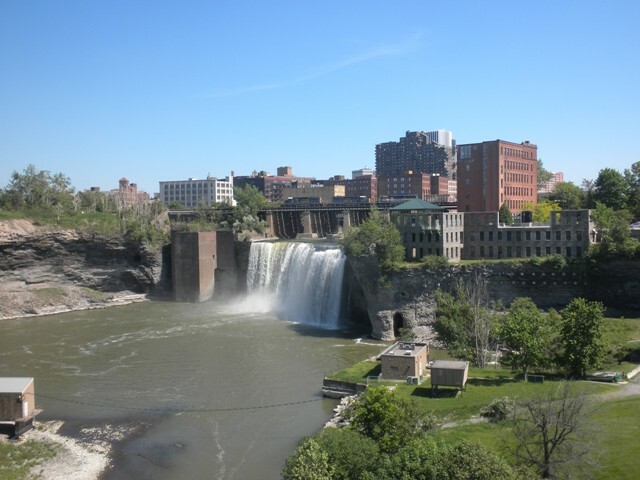 Join us for an afternoon stroll in our High Falls neighborhood. In the middle of the panorama, and in the distance, is Kodak Tower. Immediately right of the tower, and on the riverfront, is the RG&E Beebee Station, where the last turbine will take its last whirl in February. The station will then be shuttered pending some future redevelopment. Something will happen here. That’s the Pont de Rennes bridge (nee Platt Street bridge) crossing the river in the middle of the view. This is the bridge that a group here wants to convert to a Rochester version of Manhattan’s High Line. They call it the GardenAerial, and you can learn more at www.gardenaerial.org. 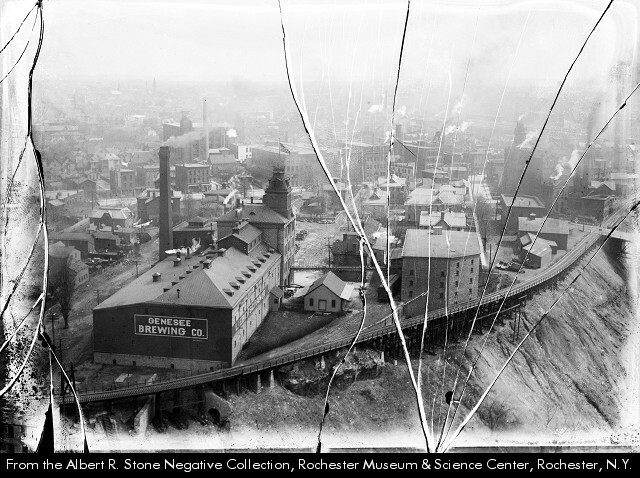 And at the right in the panorama below is the Genesee Brewery, and the historic structures at the foot of the Pont de Rennes bridge. 13 Cataract Street – threatened with demolition – is the ochre colored, taller building. Here’s a view of the brewery from the bridge. 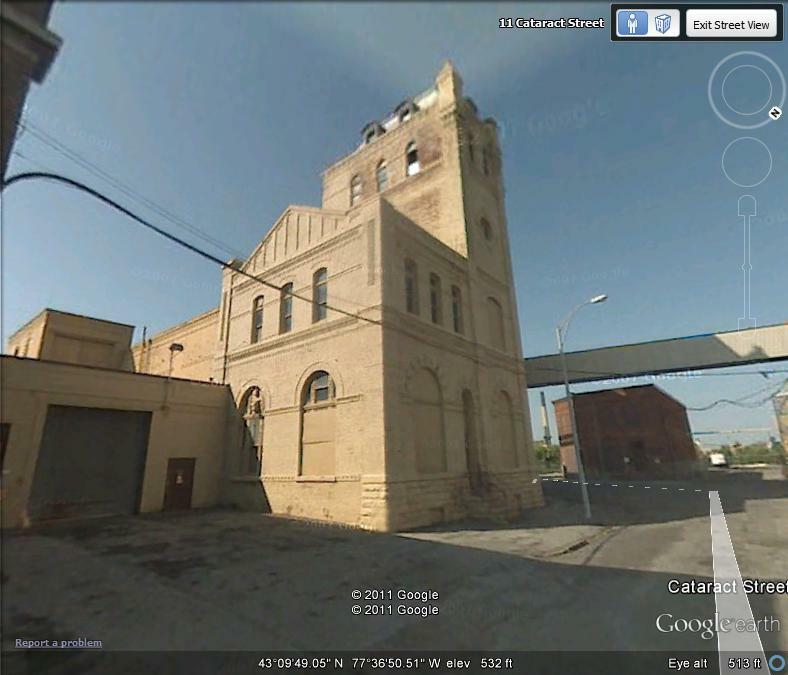 The masonry building on the left is proposed to be the new brewery visitors center. On the right is the threatened 13 Cataract Street. 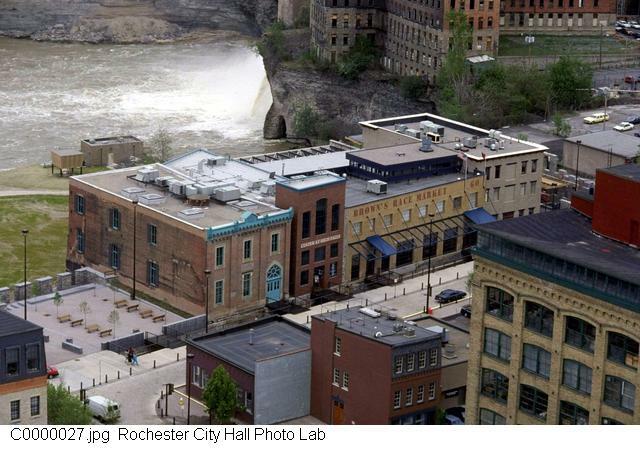 Please note that the brewery folks say that they selected the building on the left for their center because it has views of the Falls. Hmm. Stay with me on this one. It’s hard to see 13 Cataract because of the much more recent metal buildings which surround it to the west and south, and which should be removed. But the original building is pretty spectacular, and dates from the late 1880s. Remember what 13 Cataract looked like once upon a time. 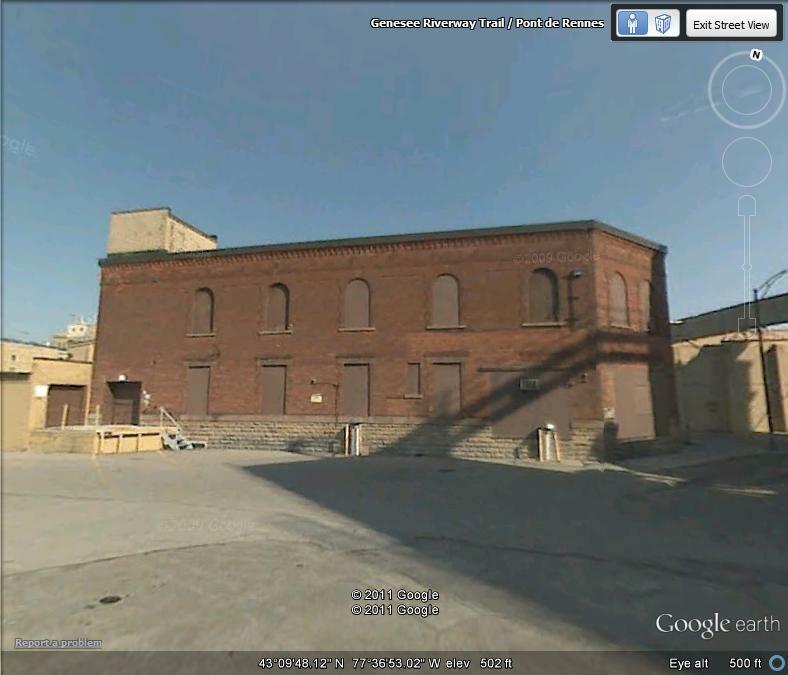 Yes, there are windows at the gable end at the right side of the building that look right out on the High Falls. The Library image was printed backwards. Thanks to a reader, now corrected. 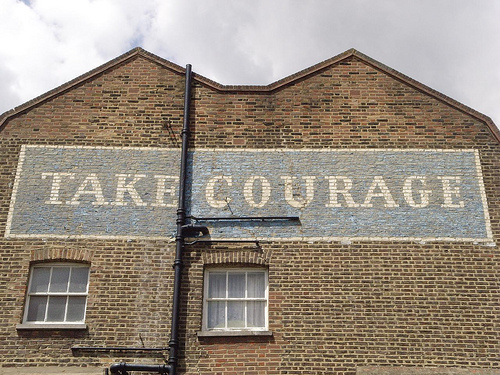 On the left of the image above is another building on the brewery campus, also designated as historic, built probably in the 1930s, and also slated for demolition. “Cataract” is carved in the limestone portion of its parapet. Just further west of the district (a couple of blocks) is Kodak HQ, and Frontier Field, home to our AAA Red Wings. Then there is the RG&E campus, now no longer used for power generation and to be redeveloped for….? Gardens, with its attendant proposed trail around the gorge at the High Falls. Then there are the precedents set by the Potosi Brewing Company in Potosi Wisconsin, the American Brewery in Baltimore, Maryland, the Pearl Brewing Company in San Antonio Texas, the Pabst Brewing Company in Milwaukee, Wisconsin, the Tivoli-Union Brewing Company in Denver, Colorado, the Brooklyn Brewing Company in Brooklyn, New York, and others. Some of these historic breweries still make beer. Some don’t. But all have been restored, and are playing important roles in each of their locales. Look them up. So let’s not tear anything down here. Let’s figure out how to make the whole big picture work. So much energy and vision and money has been spent in this part of our town, and so much more will be spent. Tearing buildings down – especially really significant ones – is worse than a damaging, destructive waste. Demolition now robs us of our history, it’s true, but robs us of real future value as well. We are awash in the heady foam of possibility. I’ll have another, now, I think. “Only two things are infinite, the universe and human stupidity, and I’m not sure about the former.” Albert Einstein. As if to conclusively prove Professor Einstein correct, we stand to lose yet another wonderful part of our particular urban narrative here in favor of – wait for it – another parking lot. I will be brief. I simply want to say yet again that one of the surest foundations for our best urban future lies in our rich, textured, and meaningful past. Tearing buildings down has rarely made any place better, and especially when the razed building is replaced by asphalt and yet more cars. We really must stop doing this. The library’s print was backwards. Now corrected. The building, at 13 Cataract Street here, is part of the Genesee Brewing campus. Its owners, who say the building is in bad shape (they own it of course, so why are their problems now our problems? Take care of your damn assets, already) want to demolish it so that they can build a visitors center and tasting room in another of the old buildings on their beer campus. 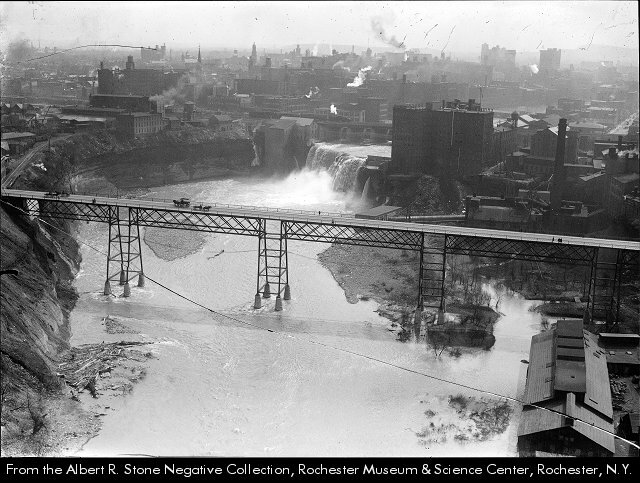 The building, and the campus, are immediately adjacent to one of our most astonishing physical assets – the High Falls of the Genesee River, seen here in 1925. This is High Falls. 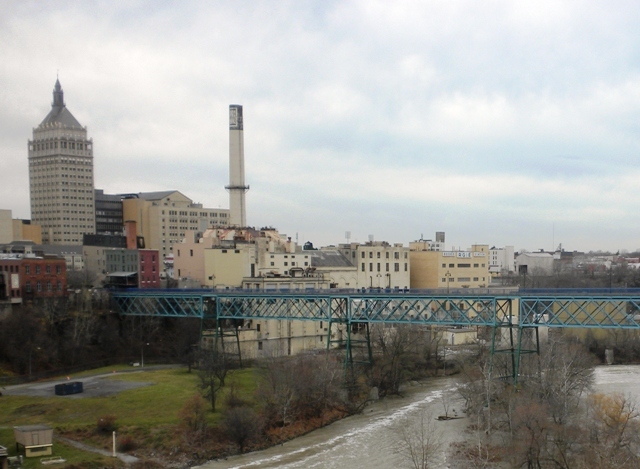 The brewery campus is to the left of the falls, adjacent to the horseshoe in the river. 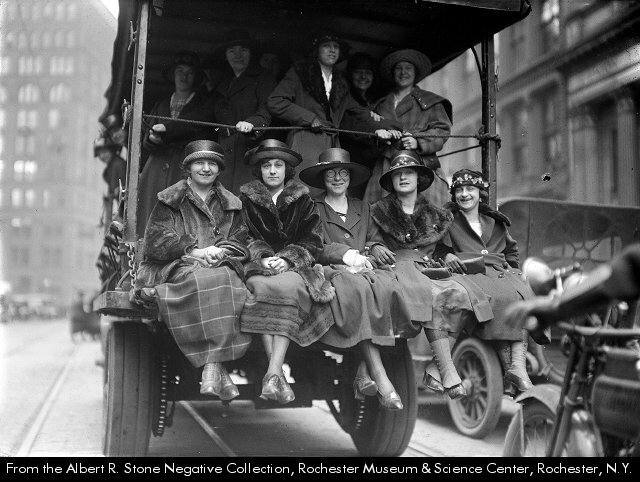 Another view, this time from 1917. 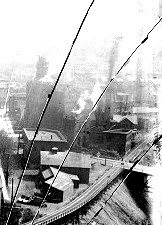 13 Cataract Street, our endangered subject, is the building at the far right of the picture, with steam emanating from its roof. The brewery is out of the picture to the left. I invite you to go and look for other images. This is an amazing place, freighted with the origins of this city. 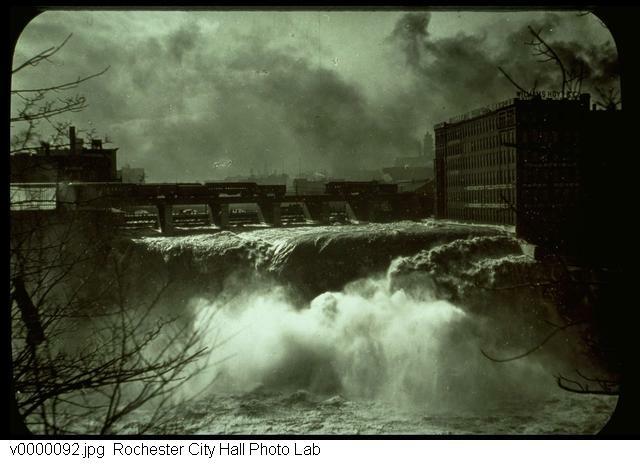 Later the High Falls themselves would run an assortment of mills as the growth of the city began in earnest. Restorations, new infrastructure, streetscaping. It worked at first, sagged for a while, and now is reviving. 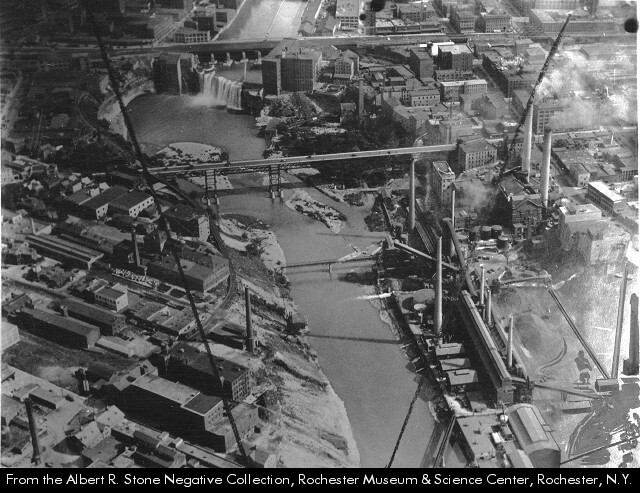 The buildings pictured above look across the river at the brewery, and our endangered subject. Lots of public and private money has gone into this place. Leverage that investment? I guess not. 1. The building’s owners know nothing about preservation and reuse, or repairing neglected buildings. They make beer. 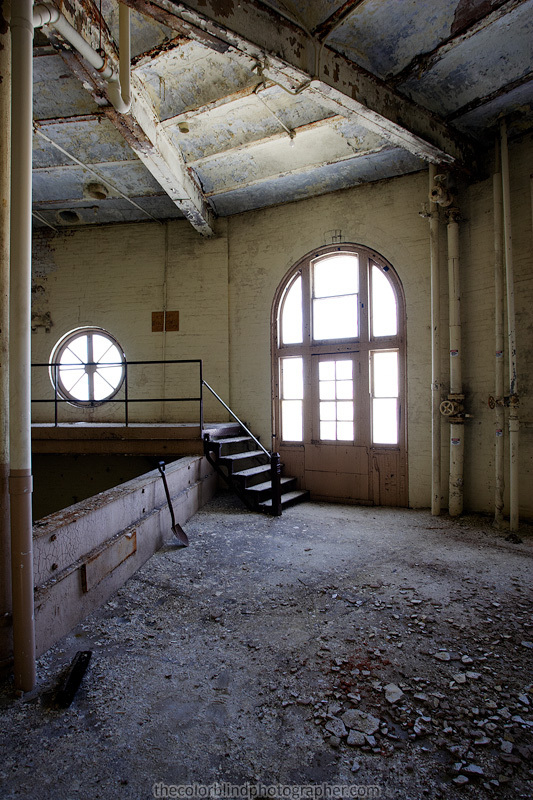 Interior of 13 Cataract Street, photo by thecolorblindphotographer.com. Dirty? Yes. Needs attention? Yes? About to fall down? Emphatically no. 2. There are people who want to save and reuse 13 Cataract Street. 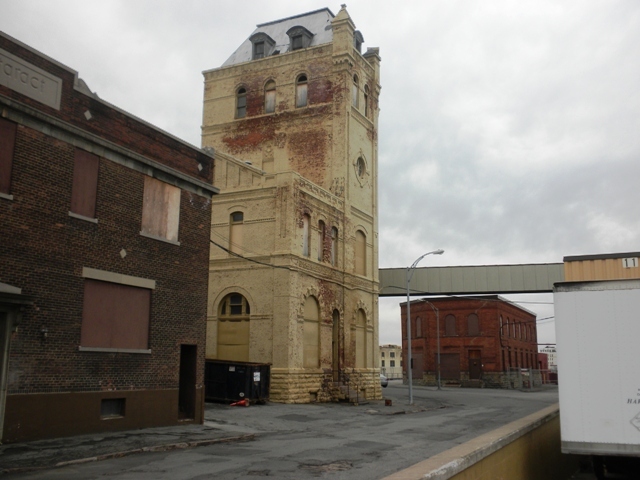 The Landmark Society of Western New York has stepped in to offer help, and to offer expertise in saving old landmarks. They stand ready to help further, given a chance. There is a group working to create an Aerial Garden, (www.gardenaerial.org/) a kind of local version of Manhattan’s wildly successful High Line project (you can look it up) on the pedestrian bridge across the river at the High Falls. They would be happy to get involved. Their plan connects the High Falls neighborhood with the beer campus. It makes clear sense that the two sides of the river will increasingly work together. There are others. But with the announcement on Friday that the brewery is moving forward with their very flawed plan, it looks like the time to talk to them in reasoned tones about real alternatives is over. They make beer. 3. 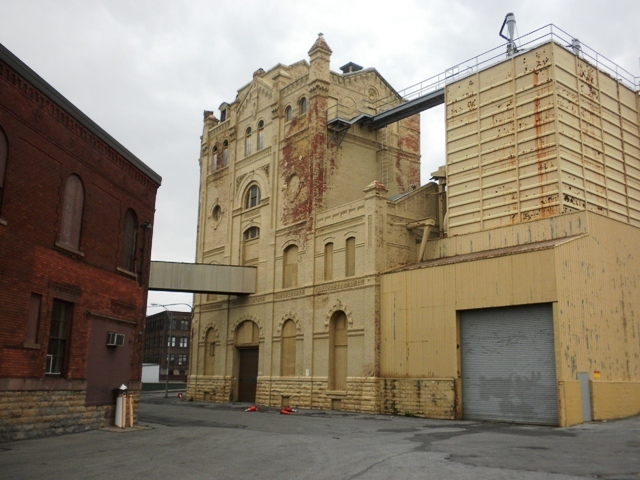 If their plan was part of a redevelopment that included the brewery tasting building in another old part of the campus, offices, residences, a visitor’s center for the Aerial Garden, and other uses, would the brewery benefit? Yes. In fact, drawings of this better possibility have been made, some time ago, and they are really pretty wonderful. Would the city benefit? Yes. Would the redevelopment act as a balancing counterweight to the work on the other side of the river? Yes. Would the brewery need to find partners? Yes. Have they reached out to find such partners? They say yes, I say no. They’ve tried to sell the building, it’s true. But have they really dug in to figure out how to make something better really work? No. They make beer. They don’t do historic preservation. But some here do, and I guess since the owners have said they are moving ahead with plans for demolition, our collective ability to help will go unused. There are folks here who understand that the key to these kinds of redevelopments lies in utilizing the tax credits available for saving and adapting historic structures. Have they been invited to help get this done? Nope. On we go, rushing towards another legacy mistake, in this city filled with legacy mistakes. 4. In Chicago, where I grew up, one of the most enlightened of all of that city’s citizens was a beer baron, Charles Wacker. 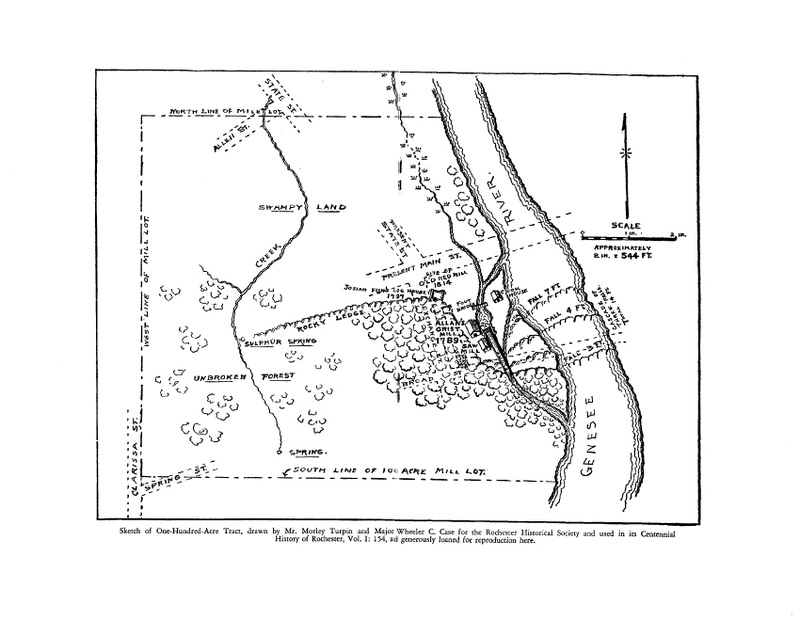 It was Wacker who was charged with building Daniel Burnham’s 1909 Plan of Chicago. And he did. He reached out to every corner of the city for support, got it, and built much of the plan, making Chicago great then, and greater now. He made beer, he made sense, and he made a great city. Enough. Any of you who visits us here often knows by now that this was once an incredible city, crafted by the enlightened and otherwise, filled with character and texture and a particular kind of vitality. And now, again, we are doing what we can to wreck our legacy, our heritage. This is happening in every city in this nation, but less in some places than others. And every time we lose yet another landmark, we sadly prove Dr. Einstein right. Alas. God save the Cataract. Almost every day as I wander around this place in images of times gone by, I find signs of who we once were. Perhaps these signs also point to what we may hope to become. 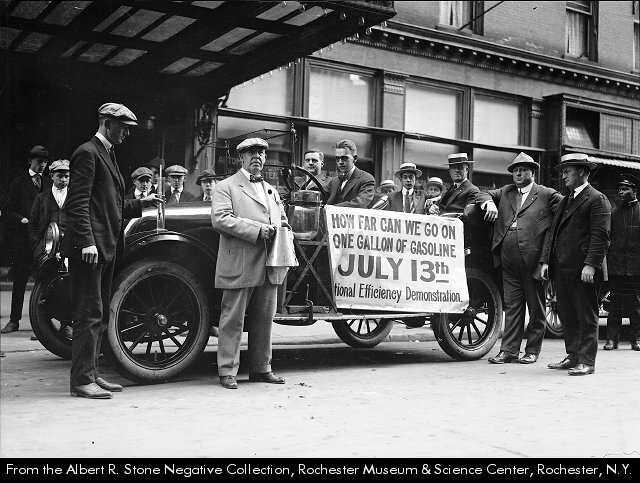 July 13th, 1913. The automobile is a Franklin. That’s Jimmy Feeney at the wheel – service manager for Franklin. City Sealer John Stephenson is about to pour a measured gallon into a glass container. Officials look on – after all, it’s a National Efficiency Demonstration. And the answer: 57.2 miles on one gallon of gasoline. Franklin Automobiles went out of business in 1934. 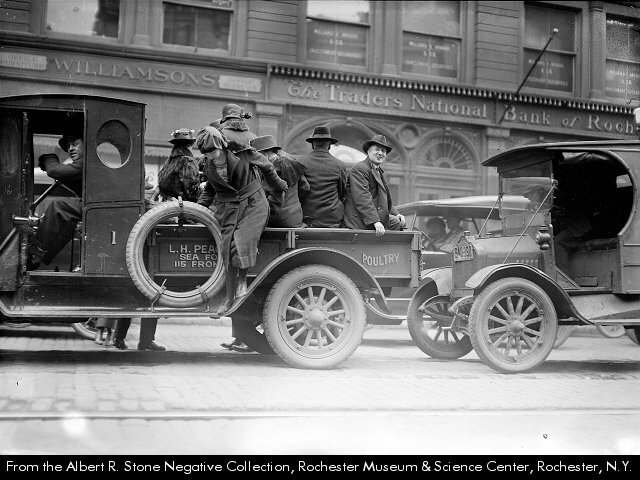 Staib’s Saloon, Blossom and Winton, 1913. Of course it was an imperfect arrangement. 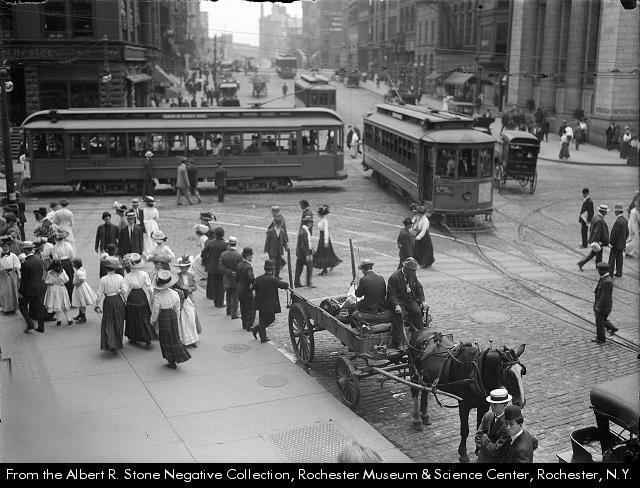 Streetcars in cities were an important, even critical, part of early 20th century urban life, but like any human conception, not without the occasional flaw. 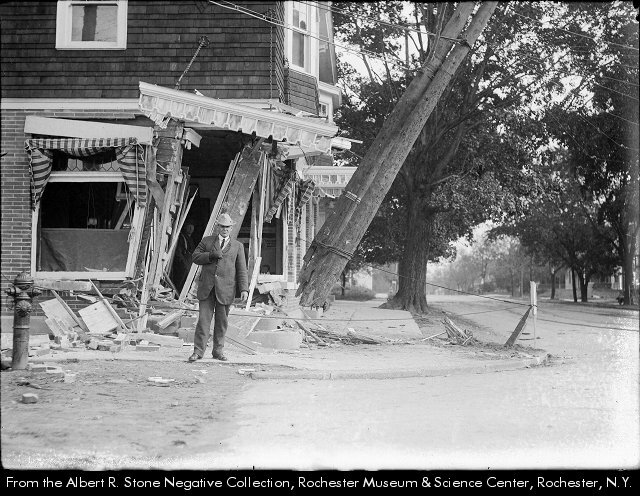 Like the one above, when a streetcar crashed through the front door of Staib’s Saloon. Perhaps the motorman was thirsty…. 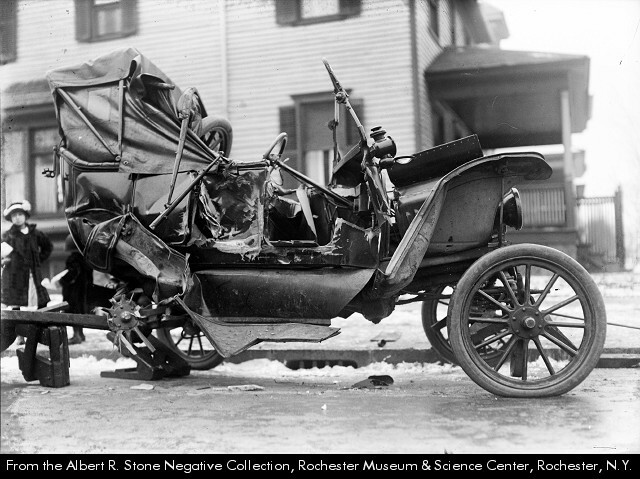 One of the biggest challenges was keeping autos and streetcars separated. 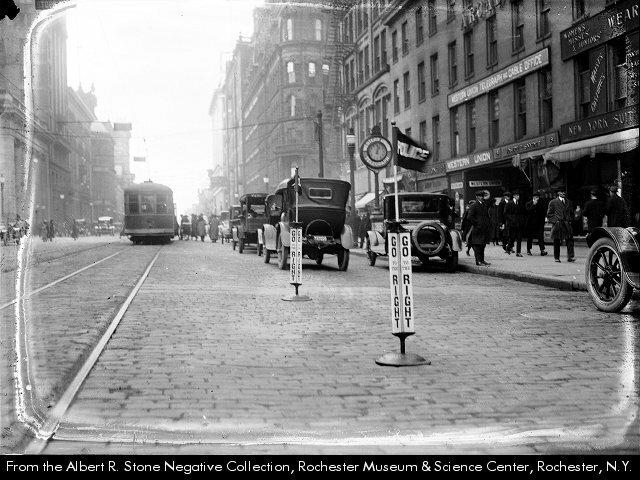 As on Main Street, below in 1919, officials experimented with a variety of controls to assure that the transit modes stayed clear of each other. Which of course they didn’t. And often the sudden presence of a car or truck on the tracks would induce various kinds of mayhem. 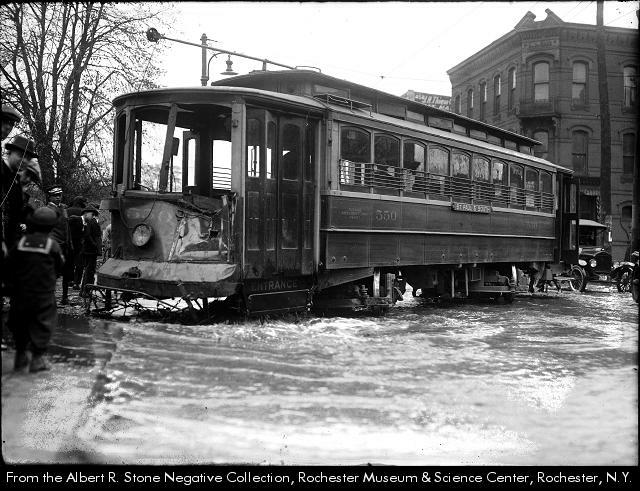 On St. Paul in 1922, a truck bumped a streetcar off the tracks, and it promptly hit a fire hydrant, causing a small tidal wave. Not sure how this next one happened right downtown, but it sure drew a crowd. 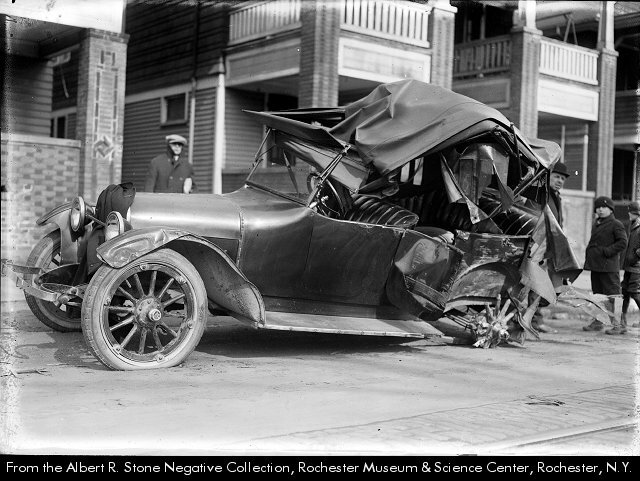 Methinks somehow a rubber-tired vehicle was involved…. 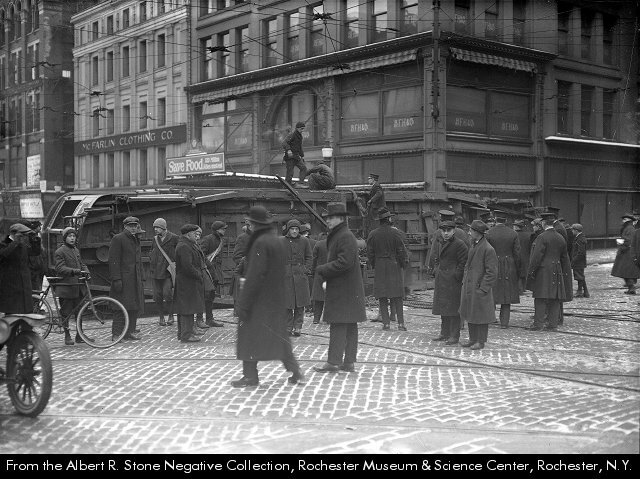 Streetcar workers occasionally went on strike (as railway companies found ways to operate the trolleys with fewer employees, for example), but the show had to go on. And it did. I can hear OSHA inspectors nationwide groaning at this image. But hey – it worked. Judging by all the smiles, everyone was having a pretty good time in spite of the work stoppage. So mishaps and hiccups notwithstanding, the streetcar city worked pretty well. Moral of the tale: cities are for feet, then rails, then cars.